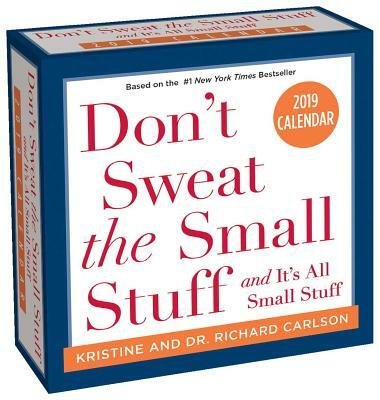 The Don't Sweat the Small Stuff 2019 Day-to-Day Calendar provides a convenient way to get your daily dose of Don't Sweat wisdom with excerpts from a variety of the books by Richard and Kristine Carlson. With over 25 million copies sold worldwide, the original Don't Sweat the Small Stuff has inspired generations of people over the past twenty years, showing them how to make small, practical changes to reduce stress, overcome challenges, and experience true, lasting joy that comes from being mindful, grateful, and present. Richard Carlson, PhD. was a best-selling author, psychotherapist, and motivational speaker. He was considered one of the world's foremost experts on happiness and stress reduction. People magazine named him one of the world's most intriguing people to watch as he helped millions learn to relax. The advice, "don't sweat the small stuff" has become part of the American culture and lexicon. Richard passed away on December 13, 2006. Kristine Carlson's life mission expands upon the phenomenal success of her late husband's work in the Don't Sweat the Small Stuff series. She continues his legacy of peaceful and mindful living through her own best-selling books, including Don't Sweat the Small Stuff for Moms, An Hour to Live, an Hour to Love, and her memoir, Heartbroken Open. Her latest book, From Heartbreak to Wholeness: A Hero's Journey to Joy, was published in June 2018. An eloquent expert on change, transition, and reinvention—and a champion for women navigating the challenges of motherhood, menopause, and other mid-life awakenings—Kristine walks, talks, and writes with a singular message: It's never too late to rediscover joy and passion to awaken your most vibrant life yet. She is active on social media, writes a blog, and hosts a weekly podcast, Don't Sweat the Small Stuff . . . Live the Big Stuff. Kristine is a sought-after inspirational speaker, and has been featured on national radio and television broadcasts, including The Today Show, Good Morning America, The View, and The Oprah Winfrey Show. Her Ted Talk may be viewed at http://www.youtube.com/watch?v=aqDaVCof3Bo.